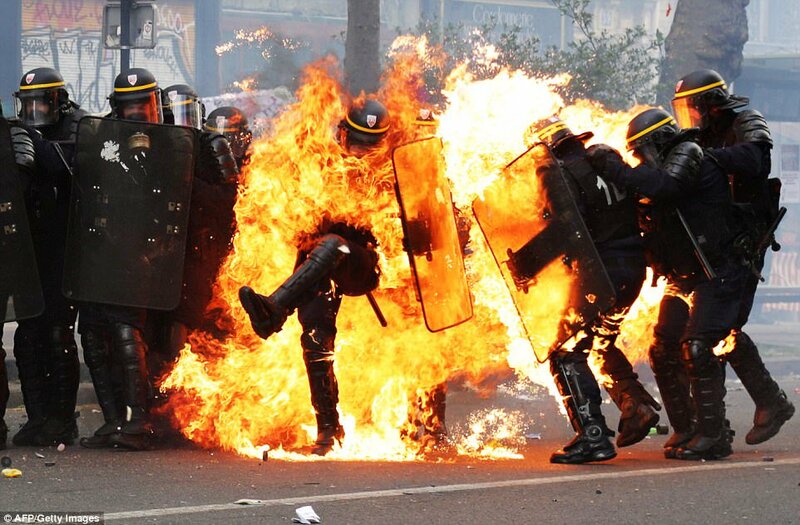 May Day Protesters In Paris Set Police On Fire…. French police were pelted with Molotov cocktails and fireworks as hundreds of anti-Marine Le Pen activists hijacked the annual May Day march on Monday. Officers were pictured on fire while demonstrators were hit with tear gas and charged with batons as scenes turned ugly ahead of a speech by Le Pen and her presidential opponent Emmanuel Macron. Meanwhile dozens of anti-Erdogan marchers were detained in Turkey after they tried to walk to Taksim Square, an iconic protest space that had been declared off-limits by police. Ugly clashes between protesters and police were also photographed in the US, Italy, Indonesia and the Philippines.